If you’re having trouble opening the .zip file, you can download the .exe directly by clicking here. For instructions on how to connect to our Shared & Unlimited plans, please click here. Now simply go back to the DashBoard and select the VPN you just created from the Saved Logins box and then click Connect. For additional protection you can also prevent your DNS from leaking by going to the DNS Protection tab. Then check the box for “Enable DNS Protection” and then select between using OpenDNS or GoogleDNS (both work great), and then simply click Apply. 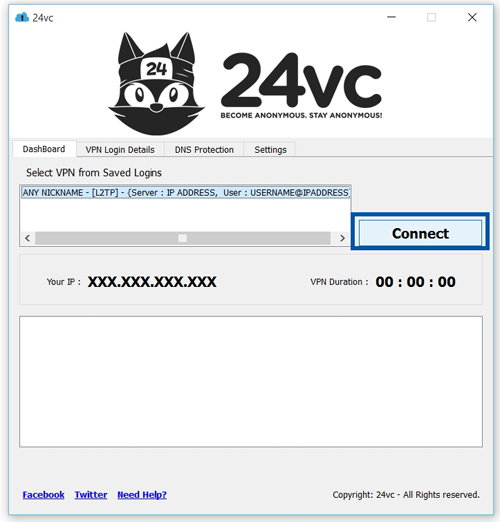 Keep in mind that this tutorial teaches you how to connect to the VPN using an L2TP connection, which is a very secure but older protocol. So the internet speed won’t be as fast, as if you connected via OpenVPN or Softether. So if you need faster browsing speeds we recommend using OpenVPN or Softether instead. For OpenVPN you would need an .ovpn configuration file to use with our software, simply open a support ticket with our technical support team and they will provide you with the necessary files for your specific VPN. Or you can use Softether instead which does not require any additional files, and a full step by step tutorial can be found here. Managing multiple stealth accounts under one computer with our fresh ips is extremely easy! You can simply make a new user account on your computer, for all the different stealth accounts that you need to keep separated. Then install our software on each of the user accounts and configure a unique fresh ip for each user account. Note: As you switch from user account to user account make sure to disconnect the VPN before switching, this ensures that the ip address doesn’t transfer over to another user account. Or if you want to be more efficient, we recommend using VMware instead. VMware makes managing multiple accounts very easy, think of it like firefox except each tab is a new computer. So for example you can have five tabs open meaning you have 5 different computers running at the same time and if you combine that with a VPN you can literally have 5 different ip addresses running at the same time. So it makes multi-tasking between accounts extremely convenient and easy. If you’re interested in learning more about VMware, please contact our technical support team for more information. In this tutorial we will teach you how to easily block the internet traffic of a specific program, in the event that your VPN connection drops for any reason at all. We will do so by using the built in Windows 7 firewall service (which is also available on Windows 8 & 10), thus eliminating the need for any additional third party software. Following this tutorial will provide you with an extra layer of protection for your stealth accounts in case your VPN connection ever drops. For example you can have it setup so that if your VPN connection ever drops, Firefox would no longer be able to load any websites until the VPN was successfully reconnected. Thus preventing any chance of your real ip address leaking, and in doing so protecting your amazon, ebay, or paypal stealth accounts from being linked and suspended.